Senator Rex Patrick in Western Australia. 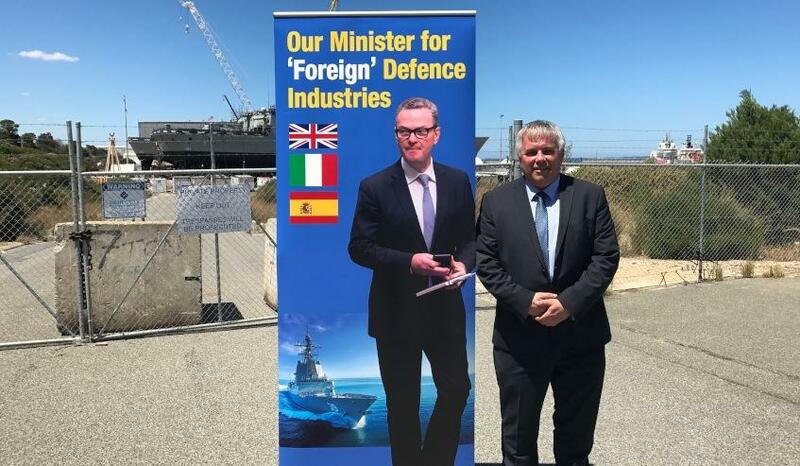 Senator Rex Patrick has called on Defence Industry Minister Christopher Pyne to immediately amend the $35 billion SEA 5000 Future Frigate tender and mandate the use of Austal and ASC. Patrick visited Austal's facilities in Henderson, Western Australia, which entered into a joint venture with South Australia's ASC to build the Future Frigates with whichever international designer is successful in its bid. Senator Patrick invited Minister Pyne’s WA cabinet ministers Julie Bishop, Michaelia Cash, Mathias Cormann, Michael Keenan, Christian Porter and Ken Wyatt to join him today at Austal, but none responded to the call. The newly minted senator slammed the federal government for its decision to not mandate the use of Australian companies in the tender. "Both are being undermined by the federal government who has stated a preference in the tender for this work to be entirely managed by foreigners," the senator said. Tender documents released in March to the three foreign designers – BAE Systems, Fincantieri and Navantia – were leaked in August and revealed the federal government does not want the foreign designers to “subcontract in its entirety” the responsibility for build management and supervision on the project. Senator Patrick, a former submariner, criticised the unprecedented approach the government has taken to this project, saying no other country would bring in a foreign shipbuilder and supply a taxpayer-funded shipyard in preference to using an already established and sovereign shipbuilding capability to build their navy ships. "They are actually using taxpayers money to introduce a foreign competitor into the Australian market.That is both absurd and offensive," he said. "I acknowledge that we need a foreign designer for this program but our Australian industry is world-class and quite capable of leading the build. "Austal's CEO David Singleton gave evidence to a Senate inquiry in September that if local shipbuilders were involved, an extra four export jobs would be created for each one involved in the build. That's thousands of Aussie jobs." Despite Minister Pyne saying that altering the tender now would cause a two year delay – a claim ridiculed as “bullship” by former senator Nick Xenophon – Patrick has refuted these claims, adding that the recent Offshore Patrol Vessel (OPV) decision, which saw the government choose Lürssen's design but introduce a different teaming partner in Austal, is evidence that the tender can be changed and has called on the government to do it now, rather than later. The call comes just days after Defence Connect revealed the three tenderers have reignited conversations with ASC since it was awarded the build of the first two OPVs. “But since the award of the OPV project the announcement that ASC shipbuilding would be building those ships, all three designers are back to the table, everybody is very enthusiastic, and we're actively working through models to collaborate for the future. The nine Future Frigate vessels are scheduled to begin construction in Adelaide in 2020 and will replace Australia's Anzac frigate fleet. A decision on the successful tenderer is expected by April next year.